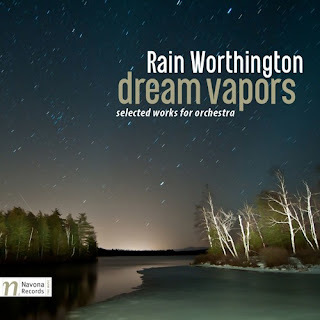 The blog has covered the music of composer Rain Worthington in a number of anthologies, but for the first time we encounter a full CD of her orchestral works, her inaugural offering, in Dream Vapors (Navona 6025), featuring variously the Czech Philharmonic under Robert Ian Winstin, the Moravian Philharmonic under Petr Vronsky, and the Russian Philharmonic under Ovidiu Marinescu. The orchestras all come to the music well prepared and give us fine readings. Rain Worthington's music here makes characteristic use of chromaticism in a tonally rooted, expressively heightened modern mode. There are seven fairly short works represented, written between 2001 and 2013. There is a remarkable, inimitable stylistic unity to be heard throughout, filled with expressive feeling but not typically romantic, sprawling tonal landscapes that have a mysterious, searching quality. For the record the works are as follows: "Shredding Glass" (2004), "Reversing Mirrors in the Quiet" (2012), "Tracing A Dream" (2009), "Fast Through Dark Winds" (2013), "Within A Dance" (2012), "Yet Still Night" (2001), and "Of Time Remembered" (2011). Each somehow captures an inner journey through a twilight world of moody sound colors, lingering on chromatic tonal sequences that expand linearly into dramatic fields of tonal encounters. They are slightly akin to Swedish composer Alan Pettersson in their chromatic expressivity, yet not quite so dark, less bleak, and ultimately distinct. Both are prime examples of an expressively tonal edgy modernism, with Ms. Worthington working here in more compact structures that have their say and leave us, to make room for yet another tone poem. She has the ability to state her compositional case to us directly, as it were, in absolutely concrete if mystical terms. She somehow makes clear to us how we experience the transitional, impermanent and ever shifting quality of a later modernist world. Perhaps I am reading into the music, but a sort of chromatic instability within a rooted quality most certainly comes at us as listeners and we respond. The size of the orchestra ranges between smaller to more full, yet it is the impact of the composing in every case that stands out as full of dark, burnished color. She is a master of her own orchestral palette. Each work seems just right for the forces at hand. To honor both her grandmother and her mother, Rain has directed that all her artist’s proceeds from the purchase of the Dream Vapors album be donated through PARMA Recordings to the Cure Alzheimer’s Fund (a research 501(c)(3) public charity registered under the name, Alzheimer’s Disease Research Foundation). Rain Worthington is a contemporary voice that demands to be heard. The present first collection establishes her as a unique orchestral exponent, an inspired artist saying something definite and compelling today. My sources of inspiration are so directly rooted in emotions and my processing and translating life experiences, that it is always my hope that the music can, in turn, resonate with listeners in personal ways. Thank you so much for your thoughtful listening, for your openness, and for this wonderful understanding of my music. It is very much my delight to hear and write about this music. It has that magical something and I do live for the pleasure of hearing such things, so I am very much in your debt and I hope very many others can experience what I do with their ear-time on "Dream Vapors"! Wonderful review . . . I am looking forward to hearing the full CD! Great review, Grego! Rain sent me an advance copy of the CD as well and I absolutely love it. I'm listening to it as I write this. Be sure to check out the interview I did with her on the Composer on Fire podcast that comes out this week. Thanks very much! She has a way about her musically, that is for sure. I will try and track down your Composer on Fire site. Thanks for commenting and letting us know.